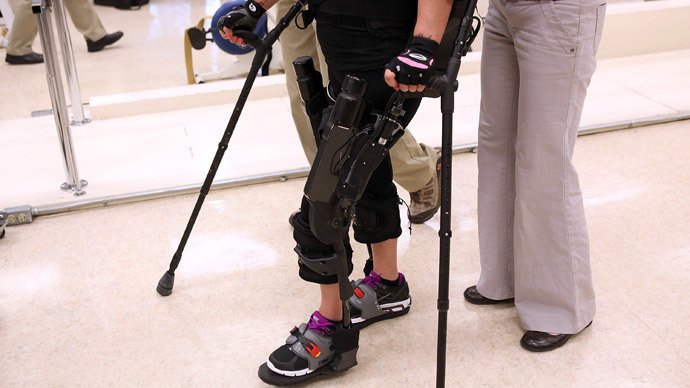 Researchers have helped four paralyzed men to regain movement in their legs and feet using electric shocks. The study has been hailed as a milestone and could pave the way for groundbreaking treatments for paralysis patients.Researchers at the University of Louisville, Kentucky, USA, are pioneering a new technique to treat paralysis. In a study published in UK science magazine the Brain, they showed that four men regained limited ability to move their legs and feet after an electric device was implanted in their spines. The scientists behind the study have hailed the research as a “milestone,” but stress they have not found a “miracle cure”for paralysis. The results show that there is hope for people with a serious spinal cord injury, said Dr. Roderic Pettigrew, director of the National Institute of Biomedical Imaging and Bioengineering, part of the National Institutes of Health, to Reuters. The research centers around the success story of college baseball star Rob Summers, who was paralyzed from the neck down after a hit-and-run car accident in 2006. In 2009, Summers underwent a procedure to implant a small device that admits electrical pulses in his spine. Just three days after the operation he was able to stand and walk supported on a treadmill. The spinal cord acts like the body’s messaging system, carrying commands from the brain to different parts of the body. If the cord is damaged, it makes it more difficult for those messages to get through. The electrical pulses from the implant stimulate the spinal column and make it more receptive to messages from the brain. Researchers at Louisville repeated the procedure with three other paralysis patients who have regained partial movement. They were able to wiggle their toes, lift their legs and stand very briefly, but still have to use wheelchairs to get around. "Now that spinal stimulation has been successful in four out of four patients, there is evidence to suggest that a large cohort of individuals, previously with little realistic hope of any meaningful recovery from spinal cord injury, may benefit from this,”said Pettigrew. One of the three men who received an implant, Dustin Shillcox, said the procedure has given him more confidence and he feels more comfortable going out. The Louisville researchers say that with advances in technology for the electric implants may lead to non-invasive electrical stimulators that will deliver pulses through the skin. Rival studies into potential cures for paralysis also include research into stem cells.